There are many foods that can be frozen to keep them preserved until they are needed. However, many people do not realize freezing is a great way to keep from throwing away food. This can be a big money saver when you make large quantities of foods you can freeze and keep as a supply for many days worth of leftovers. One of the most crucial things you can do when preparing foods you can freeze is to date when you are freezing the food. This helps you to determine the best time to thaw it for use. Another thing to keep in mind is the seasonality of some foods. This may help you determine the best food options during different parts of the year. This will include various fruits and vegetables. One benefit of freezing foods is that it can allow you to prepare and indulge in a type of meal that might be out of season. Knowing foods you can freeze provides you a great way to prevent waste. Many people who prepare a large meal often throw away leftovers that could easily have been frozen. The most important aspect to keep in mind when freezing foods is to use the proper containers. For example, covering items with plastic is one of the worst methods you can use when freezing foods. The best option to keep foods you can freeze involves the use of freezer bags and containers. You can easily find these items at any local grocery store. The next step is to research and create a list of different foods you can freeze. This includes baked goods, dough, and other types of foods. A home cooked meal or anything that is prepared by hand is often more affordable to make than items that are bought at the store. This includes pancakes, waffles, and even pizza. If you prepare meals before they are needed, then reheating is all that is necessary. 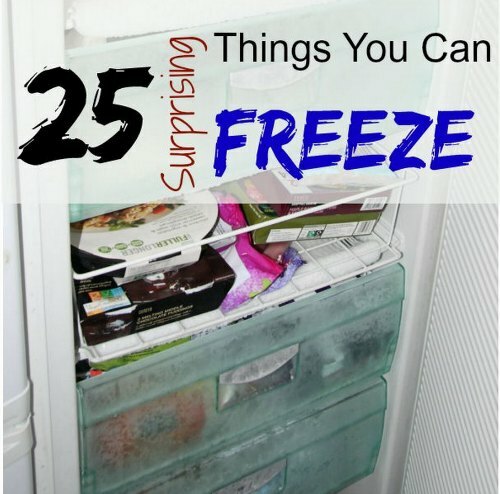 Most foods you can freeze will last for weeks or months before they need to be thrown out.